Although videogames are seen by many as a waste of time, one thing they do undeniably well is teach. The problem is that educational games are about as much a game as low-fat ice cream is delicious. Both leave a bad taste in your mouth and are generally unfulfilling. That’s because there’s a fundamental difference between games made to teach and games where you learn. In the former, you know you’re being lectured to, while in the latter, you’re having fun and just happen to learn. If you have children in school, you’ve likely come across Mathletics, the educational “game” that schools use to teach maths. Contrast a maths question from the Mathletics site where students are rewarded with points with a level in Wuzzit Trouble where students need to turn cogs that differ in the number of teeth to reach the right position of a dial to free a wuzzit. The popular Mathletics program adopted by schools contrasted with Wuzzit Trouble. Both teach maths, but one does it intuitively. Both games teach maths, but one is a game rather than being a gamified version of a maths equations. By ignoring traditional symbolism, Wuzzit Trouble teaches through a fun intuitive mechanism where players can’t help but learn if they play long enough. The important lesson here is that students are learning through a familiar framework that minimises the costs of mistakes and allows the opportunity for discovery. The problem is, however, that games such as Wuzzit Trouble and Dragon Box take a substantial amount of time to create and we can’t expect educators to invest such time. But what if using games to teach wasn’t either difficult or time consuming? What if current games could be hijacked for education? What if there were easy ways to manipulate code? And what if the creation of games could be part of the lesson? The value of Portal 2 and Minecraft as teaching tools is due to more than their popularity. It’s because they allow students to create worlds and manipulate the rules that govern them to explore scientific phenomena in fun and intuitive ways. A quick search for lesson plans for either game provides numerous examples, often on blogs that provide insight into individual successes and failures. Physics With Portals is one such blog, where high school teacher Cameron Pittman explains how he teaches Netwon’s Laws. A crash-course in Newton’s laws – with Portal 2. In a similar way, Minecraft can be used to teach simple mathematical concepts such as perimeter and area, to more complex ideas such as probabilities and reaction times. It’s not only sciences that benefit from a technological perspective. Remixing College English is a website by English professor Tanya Sasser that explores ways to use technology to teach writing, editing, and revision. One of my favourite posts is the idea of having students explore writing through creating text adventures reminiscent of the Choose Your Own Adventure novels. Imagine asking students to create games instead of handing in written reports. It’s clear the creators of Cuddlefish and Benthic love researched and understood their topics. Instead of marking dozens of papers, students could play and help grade each other’s games. Groups at Wisconsin and MIT have also been working on a new way to engage students by using augmented reality. Game editors such as Aris and TaleBlazer allow you to create a virtual world where students use GPS enabled smart-phones to visit map locations to interact with virtual characters. I’ve used Aris to create augmented reality games to teach evolutionary concepts such as sexual conflict and life-history trade-offs. In such games, I’ve created worlds where students take the role of male spiders searching for mates while avoiding predators. By working in teams and competing against classmates, students learn how different mating strategies evolve, why others fail, and do so in a social setting familiar to them. 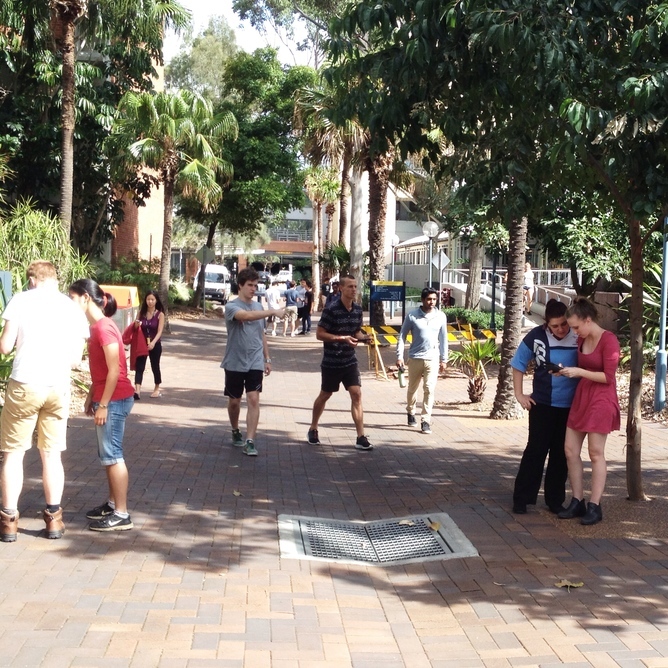 My students playing an augmented reality game on UNSW campus. I’ve also made these games and lesson plans freely available, and so have many others that teach French, game design and more. These few examples demonstrate that keeping up with technology doesn’t have to be exhausting. By entering a domain where students are comfortable, we can create a connection with students that traditional teaching plans cannot. One of the earliest advocates of game based learning, researcher James Paul Gee, recently stated that he’s disappointed with how far we’ve come with game based learning. I disagree. Given how fast technology is changing, I’m impressed with how many teachers have adopted games in their lesson plans, how many developers have made educational games, and how many continue to develop resources that are free to use. The best scientists learn through discovery, and technology now allows us to provide our children with this opportunity. If you’ve come across other great ideas and methods that you’ve used for your kids or your classrooms, I’d love to hear about it in the comments. I’ve placed other examples here. It would be amazing to have a resource for those who’d like to try and make classrooms a little bit more fun. Michael Kasumovic receives funding from the Australian Research Council for his evolutionary research. He also has a fascination with video games and the potential they hold for education.